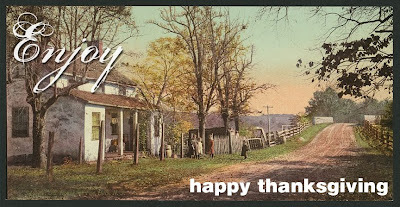 May you have a Happy Thanksgiving with family and friends. 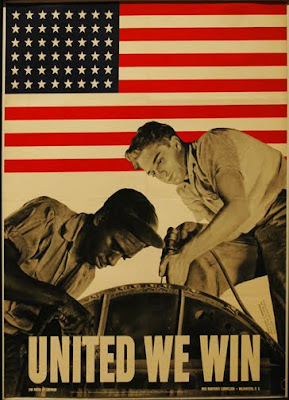 Color can be one our strongest tools to help invoke an emotion or characteristic of a company for a design. So many times I see designers getting stuck trying to come up with the perfect color combination to fit the project. 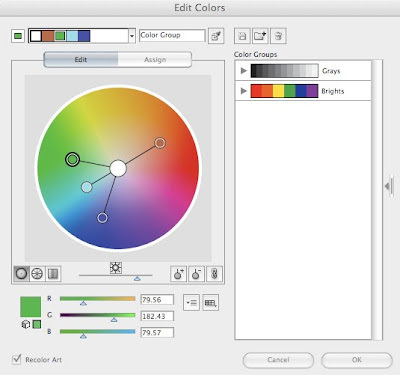 There are two tools I would like to pass along that will help in those wearisome decisions, one is the "edit" color window in Illustrator and Adobe's Kuler. In Illustrator you can select the edit color window and you will get an window like above. From this window you can select a color and it will help choose those that go along with it by sliding around on the color wheel. You can then save and use in any project. Adobe has a wonderful color website called Kuler. 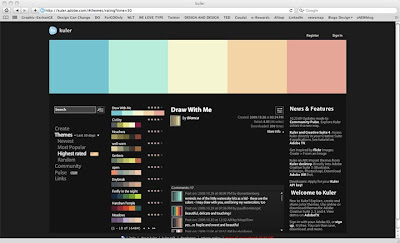 This site allows you to interact with color in several ways. First, you can take a look at the many color combinations that others have made and saved on the site. Second, you can go in and edit any combination making your own color palettes in the following ways; analogous, monochromatic, triad, complementary, compound and shades. 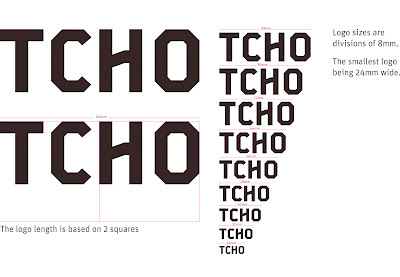 You can then save or copy down the color numerals to use in your projects. 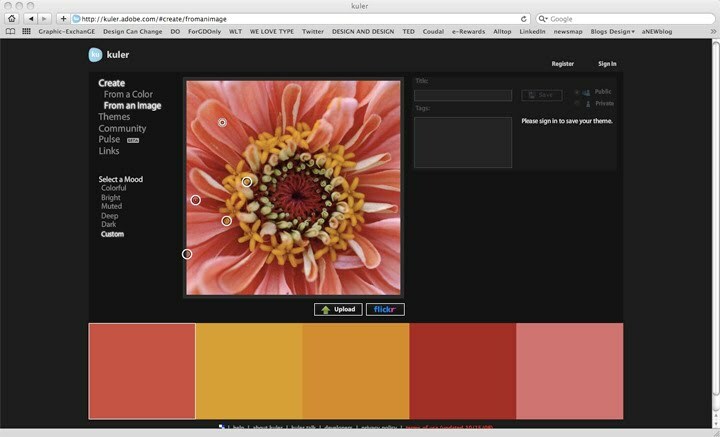 The third great use of Kuler includes an option where you can upload or pick a photo from Flicker and pick colors from the image. 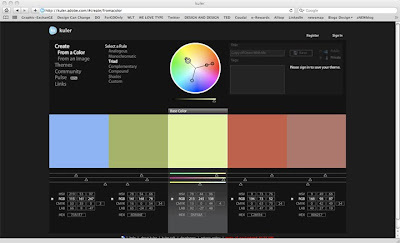 Kuler will give you the colors and they you can save that for your projects. 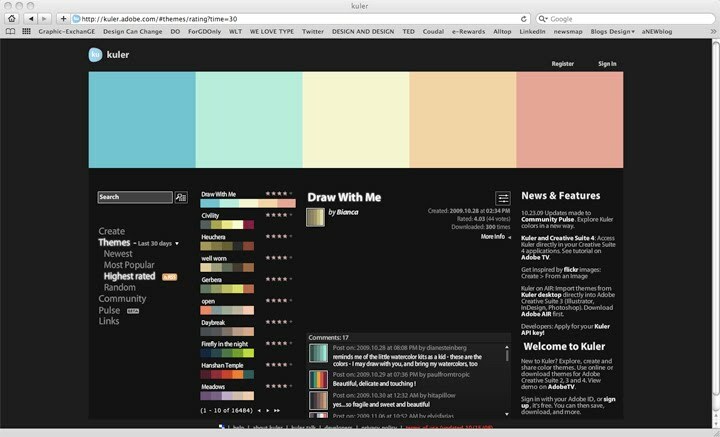 I hope this helps you get creative with color on your next project. Now go crazy with color. 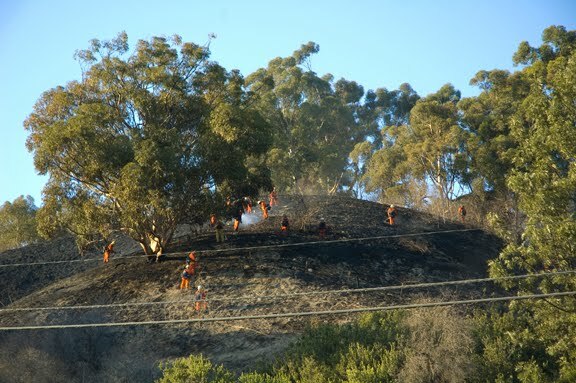 On the afternoon of November 23, I assisted on a brush fire of several acres on Hacienda Blvd. in La Habra Heights, CA. 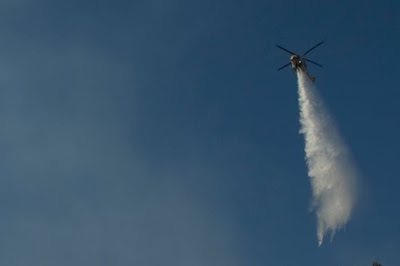 The fire broke out on a hillside and endangered several homes at the crest including a senior housing unit. 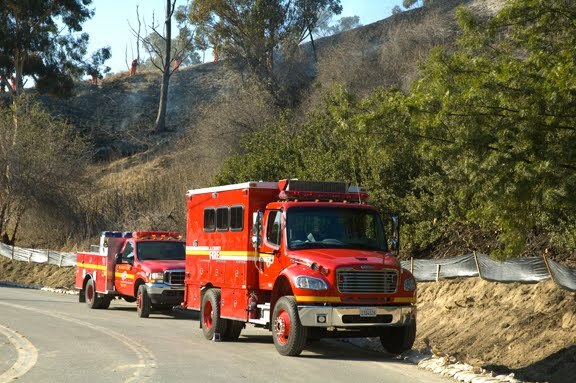 I worked as the incident commander for the La Habra Heights Fire Department and set up a unified command with the Los Angeles County Fire Department. LHHFD responded with 3 engines, a rescue squad and two command vehicles. LACoFD responded mutual aid with a full brush assignment which included numerous engines, hand crews, air attack helicopters, and command personnel. The fire was knocked down in approximately one hour followed by several hours of checking for hotspots. 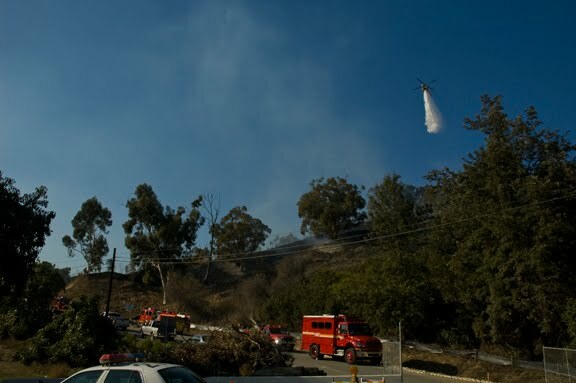 Many thanks to all the firefighter from La Habra Heights Fire Department and the LACoFD in helping to control this fire quickly and saving all endangered homes. 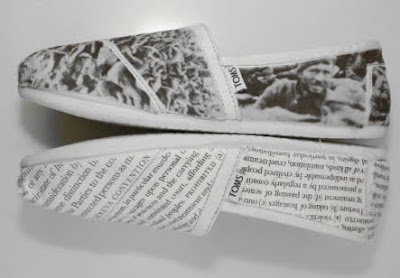 Several designers have custom designed on Tom's Shoes to help benefit the Art Director Club Scholarship fund. These designer Tom's are available to bid upon on eBay for the next few days with all proceeds going to the scholarship fund to help design students. The designer that are represented including John Maeda, James Victore, Christoph Niemann, Ellen Lupton, Jessica Helfand, and Louise Fili. I in particular like the shoes by Ellen Lupton for the dyslexic type fan and as always Louise Fili's Italian flavor. Take a walk in the shoe's of your favorite designer at this link to place a bid. 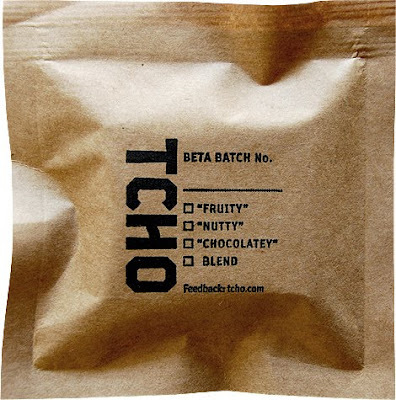 How do you build a chocolate brand? from edenspiekermann_ on Vimeo. 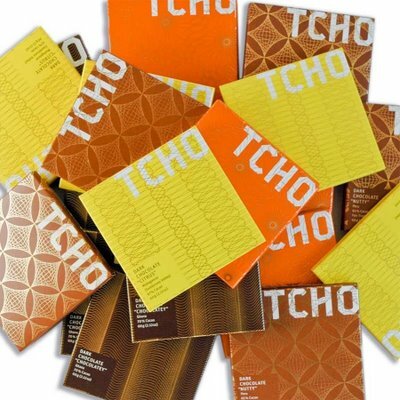 Enjoy this video on the making of the TCHO Chocolate brand from start to finish. The film reviews early concept develop to the package design and website design. A very interesting short design video. 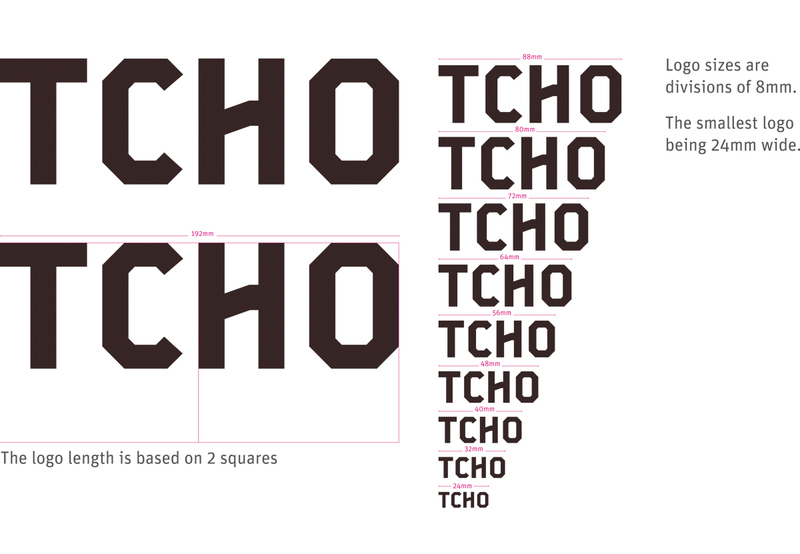 This brand, TCHO, is very successful over the many market channels with a consistent look and feel. The design was completed by Edenspiekermann. I am sure the care that went into this brand also went into the taste of each piece of chocolate. Now if I only had one of those pieces of chocolate. 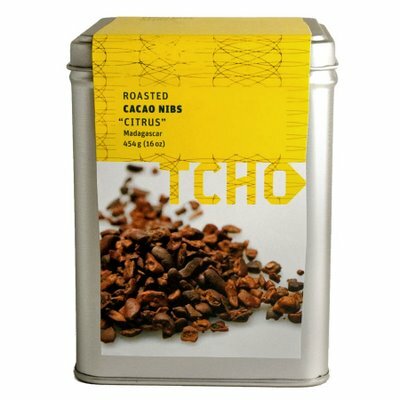 I wonder in TCHO sends out samples? John Van Hamersveld is a designer of icons, from the Endless Summer movie poster to a Beatles Album cover. John Van Hamersveld was born in Baltimore, Maryland in 1941 and took to art at an early age. 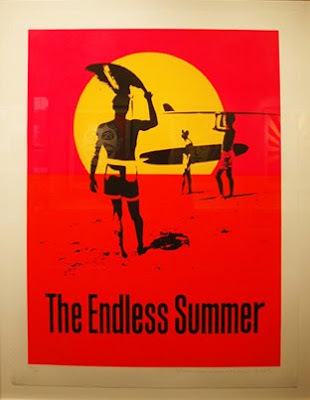 He found his way to the West Coast and has been involved in the music and film industry as a designer since he created the bold and saturated sunset for the Endless Summer poster in 1966. 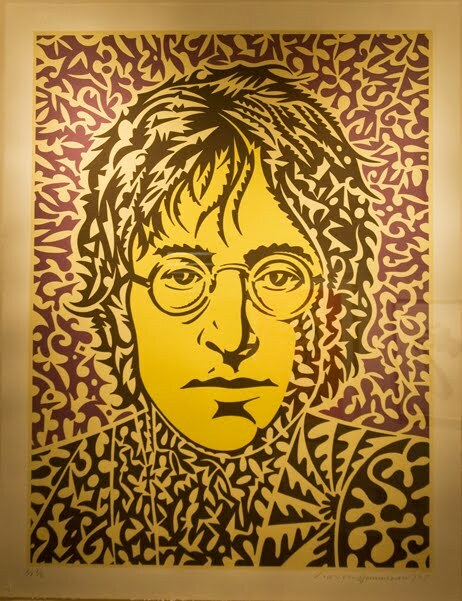 John has may iconic designs that have become a part of our design world including his Jefferson Airplane Pinnacle Indian Poster 1968, the Beatles Magical Mystery Tour cover, the Rolling Stones cover for Exile to Main Street, Johnny Face (Crazy World Ain't It? ), Jimi Hendrix, and posters for Cream at their Royal Albert Hall Reunion in 2005. 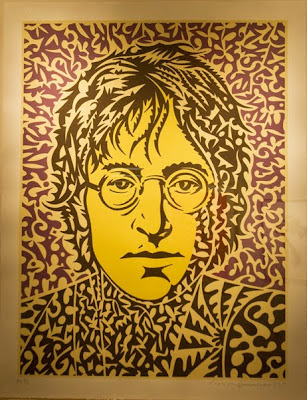 John is still working and designing today for the music and fashion industries creating works that reflect his 60's origins with a current modern day twist. 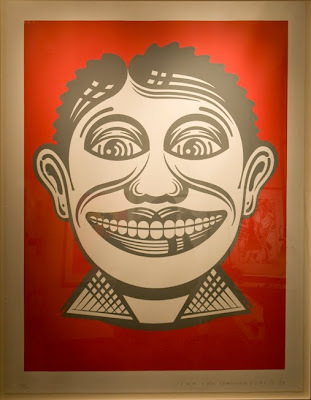 His work is still very fresh and conveys a free spirt that seem to emanate across his career. The contemporary Mozart and Beethoven for the New West Symphony are wonderful and expressive. 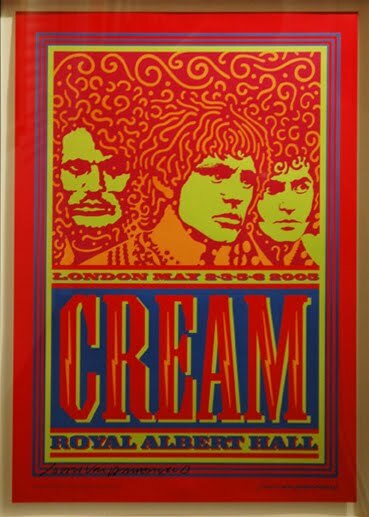 His current posters for Steve Winwood and Eric Clapton take us back to a day when concerts where about the music first. 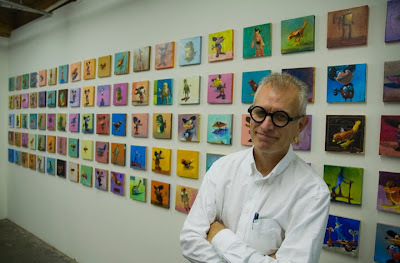 John Van Hamersveld's work can be viewed at Post-Future and johnvanhamersveld.com. 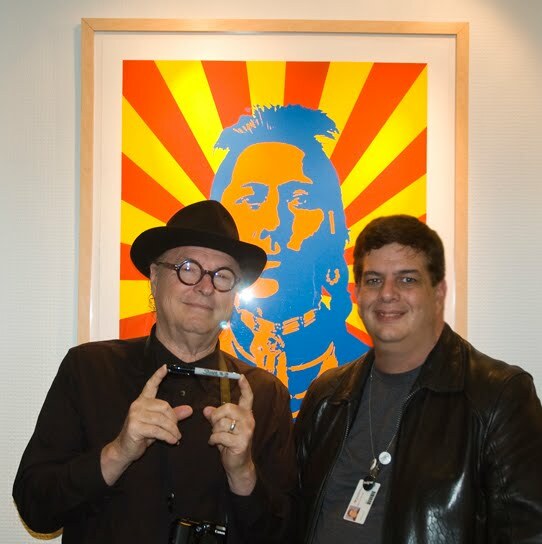 I had the pleasure to meet John a few weeks ago at the Art Institute of California - Orange County where I teach. 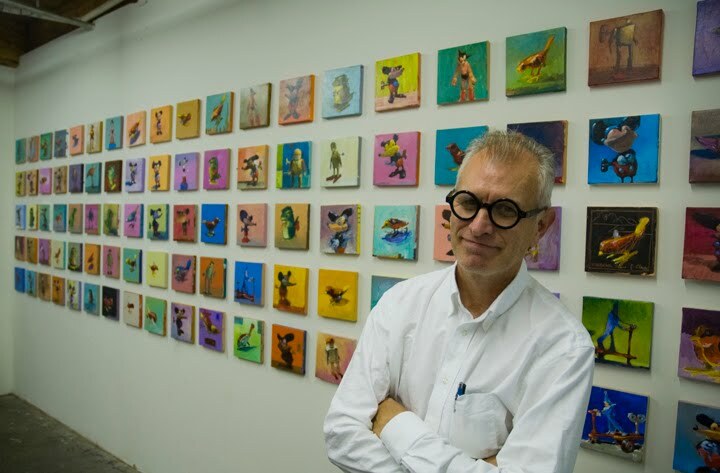 AICA-OC has a small show up on his work and John will be at the "official" gallery opening this evening, Nov. 18th from 4:30-7:30 if you are in the area and would like to meet him and have a poster signed. Mike Tracy will be featured in a group show at the Lora Schlesinger Fine Arts Gallery November 21st - December 31st. 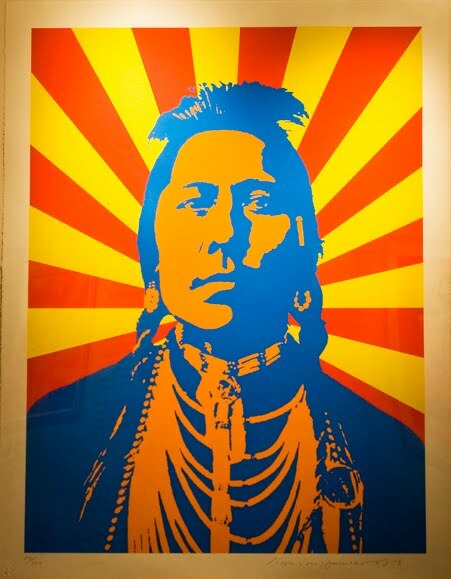 An opening reception will be held this Saturday evening from 5-7pm. 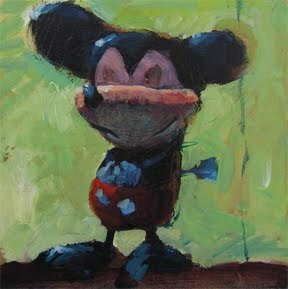 Mike will have many of his wind up toy painting from the "little monster" series on display. 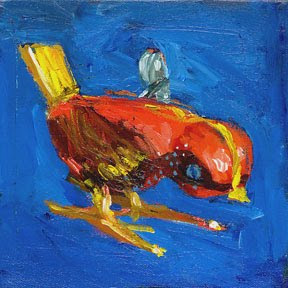 These little painting capture a radiance and energy of life that is reflected in bold brush strokes and a fervor of color. 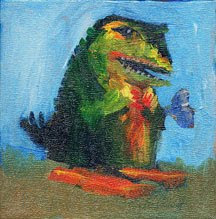 Mike's little monster series has been very well received and they have made themselves homes in many a collectors house. 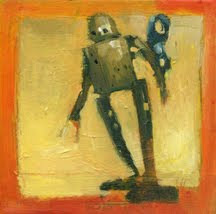 Lora Schelesinger Fine Arts is located in Santa Monica, CA. 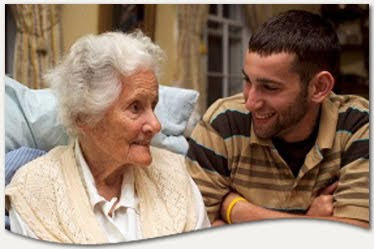 For additional information and directions please see their website or check out Mike at this link. 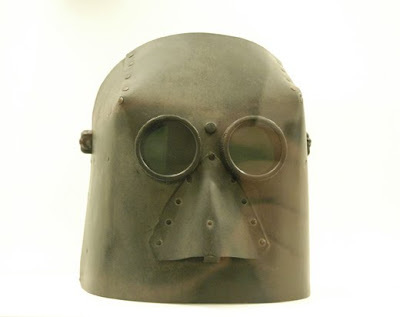 Visiting a local museum can be a great creative spark to keep your designs on fire. Museums today are not what your mother saw 30 years ago. Today, the range of work that you will find on display at a major art museum goes from the classics to modern to design to graphics to sculpture to photography. What a wonderful mix. Take along a camera and shoot what inspires you for inspiration later. Look at the details of these great works, study them and think how you can bring these ideas into your own work. I try to visit my local museums in LA on a very regular basis (I am lucky to have so many wonderful museums nearby) including LACMA, MOCA, The Getty, The Norton Simon, and OCMA. Go out and get a membership, they are very well priced and a few visits during the years will cover the cost. Take the day, go visit a museum! To continue to celebrate Eva Zeisel's 103 Birthday today, watch and enjoy her from the TED conference in Feb. 2001. She speaks of her playful search for beauty, how she thinks of herself as a "maker of things" and how she got started as a designer. Eva Zeisel - Happy 103 Birthday!! The search for the fountain of youth has been going on for ages, it seems Eva Zeisel who turn 103 on November 13 has found it. If one was to ask Eva her secret, I am sure she would answer, Design, Passion, Family and Friends. 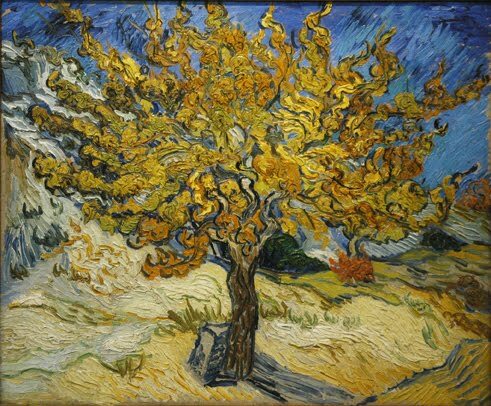 Eva was born in 1906 in Hungry and studied art and pottery in her early years. She has helped shape the world we live in as an industrial designer. “I can’t stop thinking of making things,” said Eva in a recent interview. 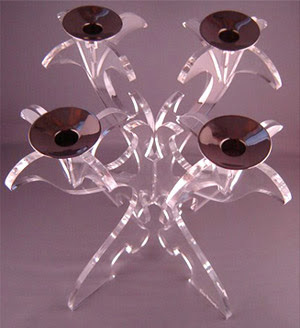 Eva is still designing and produced several new products that have come to the market. 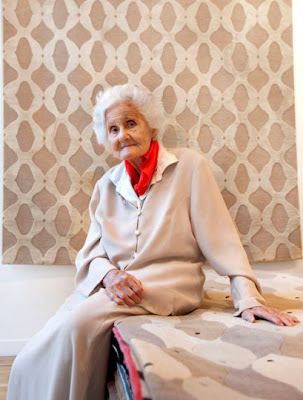 I have long admired Eva's designs, her passion and zest for life. Her work is naturalist and futurist. 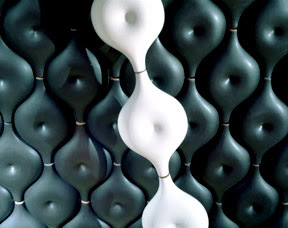 Eva has been quoted as saying she is always looking for the "playful search for beauty" in her designs. I believe she has been very successful in this quest. Eva was one of the first to design dinnerware for mass production in 1928 with the Schramberger Majolica Fabrik in Germany. 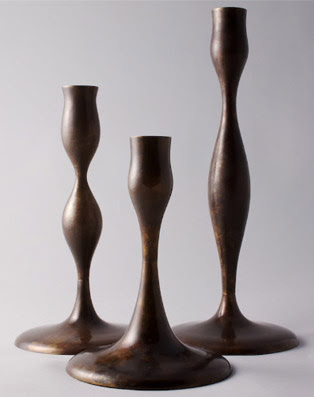 She moved to Russia in 1932 to design dinnerware, bath fixtures and numerous household products. In 1936 while working in Moscow, she was arrested by the Stalin regime and placed in a prison camp for 15 months. She was charged with “plotting against the life of Stalin”. She was finally released due to the influences of important European intellectuals that contacted Stalin. Upon Eva’s release in 1937, she traveled to Vienna then to England. She married Hans Zeisel at this time. In late 1938, Eva and Hans move to New York. She starts working on numerous designs and began teaching at the Pratt Institute in 1939, forming the industrial ceramics curriculum. Eva’s designs have been sought after over these many years. She has designed dinnerware and products for all the major china companies the world over in her career. 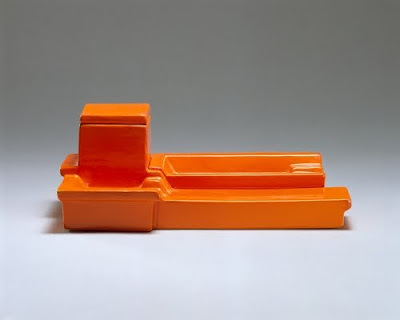 In 1946, Eva Zeisel had the first one women show at MOMA. 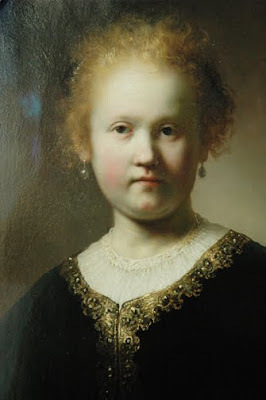 Her work can be found in every major museum collection around the world from MOMA and the Metropolitan in NYC to the Victoria and Albert in London. 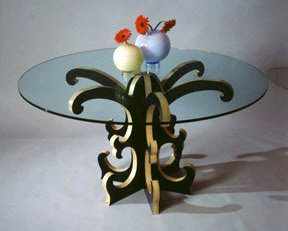 In 2005, Zeisel was awarded the Cooper-Hewitt National Design Award for Lifetime Achievement. 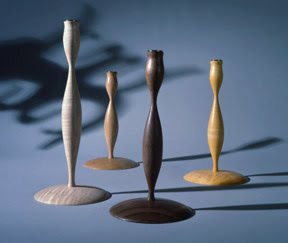 Eva’s work is available today at Eva Zeisel Originals run by her grandson, Adam Zeisel. Her designs are also available at such major outlets like Design within Reach and Crate and Barrel along with many art museum stores and galleries. Eva is still actively designing today. She works with a Design Assistant, Olivia Barry, who helps translate her ideas and Eva personally reviews the progress and designs during development. Eva has authored a book, Eva Zeisel on Design. 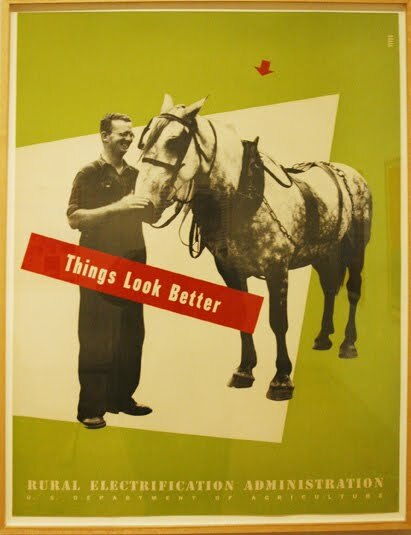 We can all learn from Eva Zeisel. Design with passion. Live life with passion. Love your family and friends. The fountain of youth has been found in each of Eva's designs. Happy Birthday Mrs. Zeisel!!! 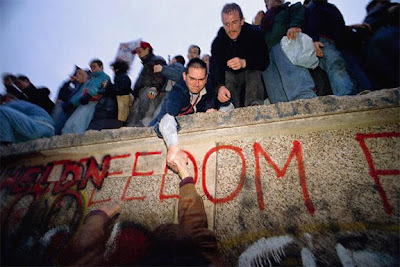 Twenty years ago history happened, the Berlin Wall came down. The 28-mile-long Berlin Wall stood as a border between East and West Berlin from 1961 to 1989. Read more at this page that shows before and after the fall of the wall from the NY Times. Everyone loves Lego. 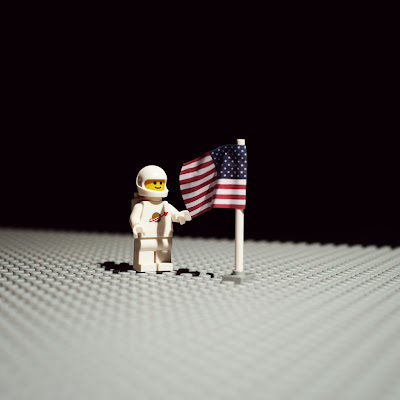 So how would the world look as Legos? 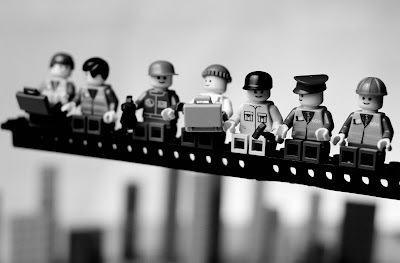 Take a classic photo, recreate it with Legos, then shoot it - this is the work of Mike Stimpson, Photographer of Plastic. View the creative work of Mike Stimpson at his website and at his Flickr page.. Currently showing at LACMA (Los Angeles County Museum of Art) is a wonderful exhibit of works by Luis Meléndez. 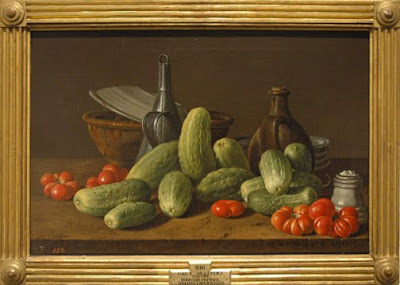 Meléndez has been called the greatest still life painter of 18th century Spain. His work has been eclipsed by the more famous Goya for centuries. 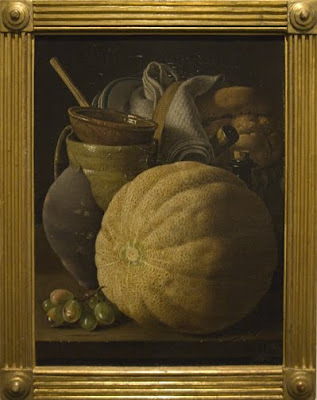 Meléndez (1715-1780) captured near-photographic images of his still life subjects. Working to gain an appointment by the royal court he was rejected due to politics thus focused on still life instead of portraits. The exhibit is composed of more then 20 paintings that show details of life during this period. 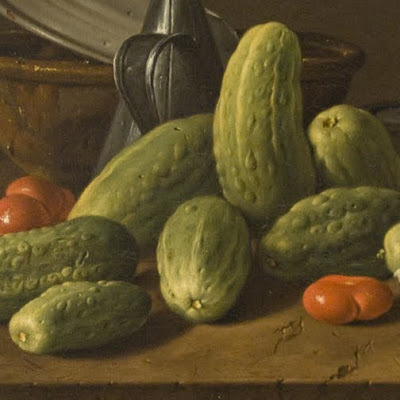 You can almost taste the fruit and smell the flowers in his painting. The details are that precise. 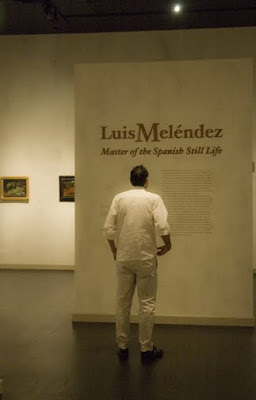 Luis Meléndez: Master of the Spanish Still Life is showing at LACMA until January 3, 2010.